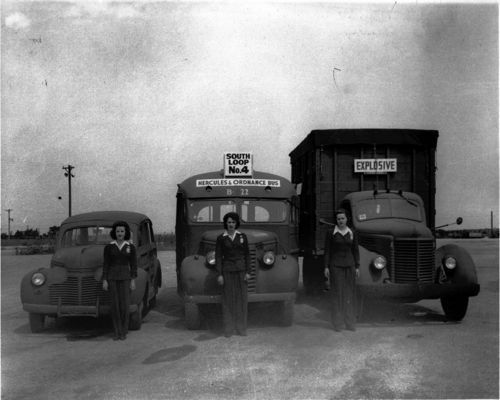 A view of three women drivers employed by Hercules Powder Company from the Sunflower Ordinance Works plant in De Soto, Kansas. The plant, established in 1941, was the world's largest smokeless powder and propellant manufacturing plant. It was owned by the U.S. government but operated by the Hercules Powder Company. The company changed it's name to the Sunflower Army Ammunition Plant on August 1, 1963.